Over the past several days, I've seen a few online meltdowns from folks in the long-standing Lee vs. Kirby debate. There's long been some contention about how much Stan Lee contributed to their joint works compared to Jack Kirby, but it's almost impossible to delineate with any precision at this point since A) the blending of words and art in a comic is fuzzy at best, and B) no one kept any records of that type thing. 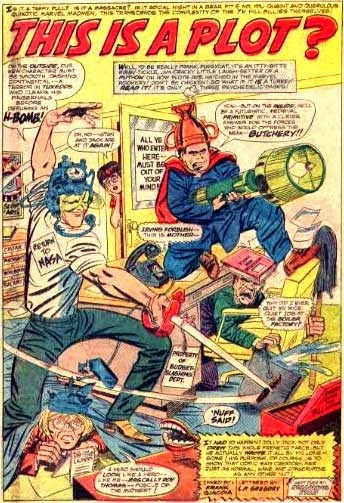 So until/unless someone creates a time machine and goes back to sit over both Kirby's and Lee's shoulders for the entirety of the 1960s, that debate isn't going to end any time soon. For whatever reason(s), some people get very emotionally invested in whatever stance they decide to take on this point. Which is strange because they don't seem to care about their stake position in and of itself, but rather the fact that they've placed their stake. The arguments tend to circle around "Mine is the correct opinion!" rather than "Here's some facts relating to the debate, and here's why I choose to make these conclusions." That two groups oppose and "debate" each other is nothing new, of course. And that it happens in that the Kirby vs. Lee issue is also not new. But, for whatever reason, I saw several online meltdowns over the issue... which is doubled curious since I spent a good deal of the weekend offline. There was all sorts of name-calling and mud-slinging, and people deleting comments by "offensive" posters (I have no idea if they were actually offensive or not), and many others throwing up their hands and walking away from the ostensibly creator appreciation groups where these frays happened. At an academic type level, I understand. These people have collected in their "in-groups" and anyone who doesn't fall within that is an outsider. And outsiders who directly confront the in-group's beliefs are considered threats that must be defended against. And, like just about with any other group, we see a member of the group as simply an extension of the group, not as an individual. It's easy for us to attack them in broad strokes because we (generally willfully) look at them exclusively through the lens of the group that's threatening. They appear as caricature of a member of that group. A straw man that's easy to dismiss as only a name or an avatar. But personally, I don't get it. Yeah, some individuals are going to rub you the wrong way for whatever reason. But those people are assholes. The individuals. Not everyone they associate with. You have a problem with the individual assholes, then you leave them and move on. There's no reason to denigrate an entire swath of people because you had problems with some of them. Someone who had been reading my Kleefeld's Fanthropology columns pointed out that the overall thrust of the column seemed to boil down to, "Can't we all just get along?" She kind of had a point. Because, like I said, at an academic level, I understand how fandoms can clash, but that we still have these asinine arguments thousands of years after we figured out that we're really just all the same with different labels is mind-boggling to me. You know, how about "Up with comics"? Or "Up with superheroes"? Or "Up with Jack Kirby"? Whatever floats your boat. Why can't we all get along? I tend to eschew labels, both for myself and others. I may be someone who loves comics, and appreciates the oeuvre of Jack Kirby, and writes about fandom, but none of those things define who I am. Love me or hate me for who I am, not whatever label you've assigned to me. And I'll judge you based on who you are, not whatever label someone's given you.